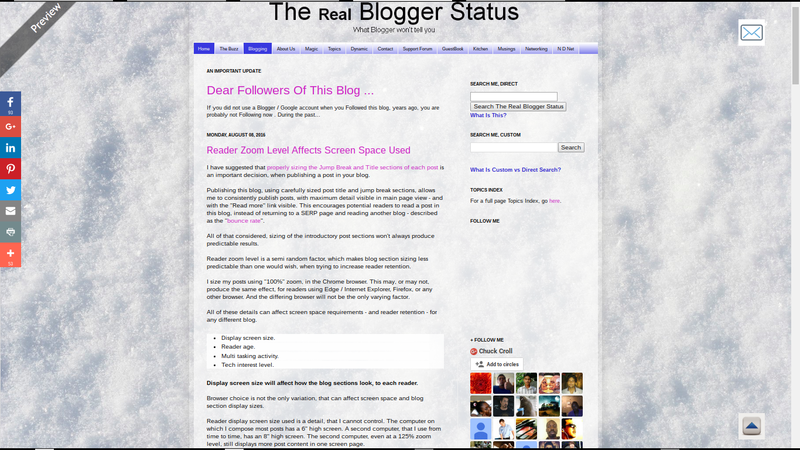 Reader zoom level is a semi random factor, which makes blog section sizing less predictable than one would wish, when trying to increase reader retention. 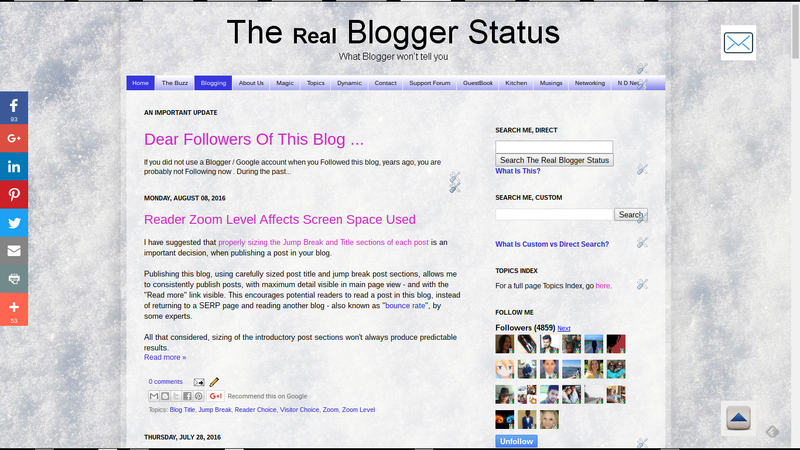 I size my posts using "100%" zoom, in the Chrome browser. This may, or may not, produce the same effect, for readers using Edge / Internet Explorer, Firefox, or any other browser. And the differing browser will not be the only varying factor. 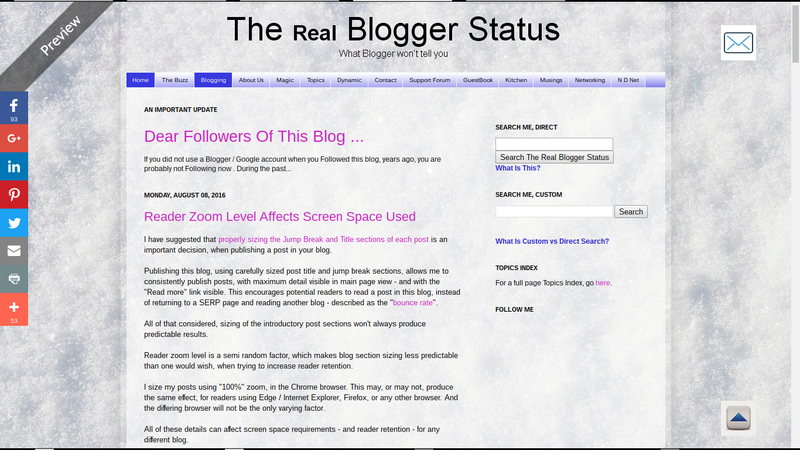 All of these details can affect zoom level, screen space requirements, and reader retention - for any different blog. 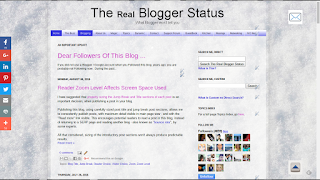 Here it is helpful for the blog owner to know about the typical reader. 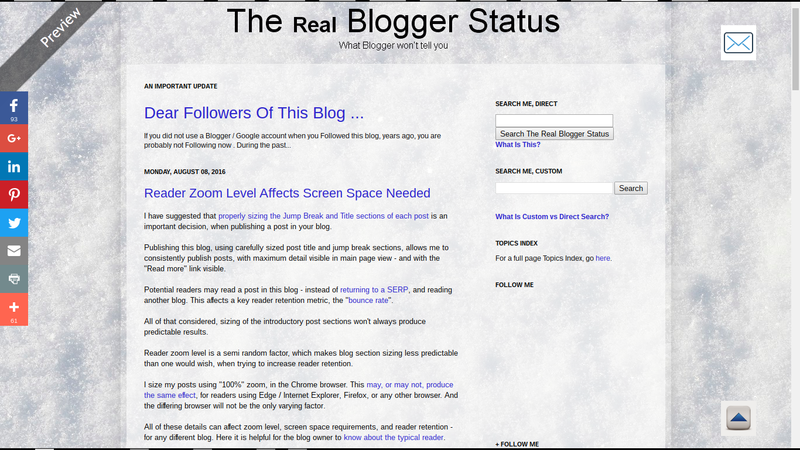 Display screen size will affect how the blog sections look, to each reader. Browser choice is not the only variation, that can affect screen space and blog section display sizes. Reader display screen size used is a detail, that I cannot control. The computer on which I compose most posts has a 6" high screen. A second computer, that I use from time to time, has an 8" high screen. The second computer, even at a 125% zoom level, still displays more post content in one screen page. This post (in main page view) displayed, at 100% zoom, on an 6" vertical display. Let's compare this post, displayed at several zoom levels. Here's this post, in the individual post page display - without Jump Break. See how it looks, zoomed in various font sizes. Note that here I use a maximised browser window, though some readers will resize the browser window to fit the blog content. This post (in Preview mode) displayed, at 100% zoom, on an 6" vertical display. This post (in Preview mode) displayed, at 100% zoom, on an 10" vertical display. This post (in Preview mode) displayed, at 75% zoom level. Smaller zoom is more likely to be used by people with better eyesight - using better resolution and more expensive computers, and smaller browser windows. This post (in Preview mode) displayed, at 125% zoom level. Larger zoom is more likely to be used by people with marginally worse eyesight. This will frequently involve older people. Older readers will be more likely to use higher zoom levels. 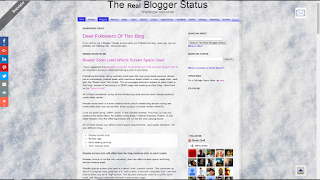 Reader age is another detail which each blog author may consider, in blog design. Blogs which attract older readers should be designed for displays which use higher zoom levels - or use larger fonts, to begin. Older readers, with marginal eyesight, will be more likely to surf the web with their browsers zoomed higher. Multi tasking encourages smaller browser windows - and lower zoom levels. Younger readers, who like to multi task, will probably use low zoom - and size the browser window smaller, so they can have multiple windows, simultaneously visible in large computer displays. Older readers will be more likely to focus on one task at a time - and will maximise the browser window, with higher zoom. 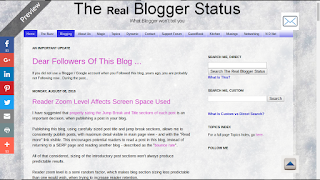 Blog subject may produce readers of differing age and tech interest. Each blog, depending upon its content, may be more or less likely to interest readers of a given age and / or and tech interest level. People of different tech interest levels may also be more or less likely to use computers with higher resolution, and may multi task using smaller browser windows. 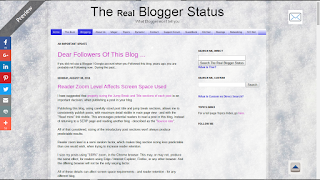 Each blog owner will have to consider the various issues mentioned above - for each post published - and decide what screen sizes and zoom levels might be preferred by the target reader audience. 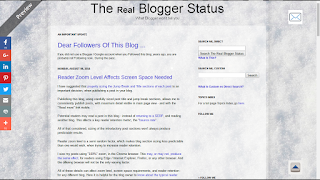 Only a blog owner can decide what reader audience may be more interested in each individual post - and may benefit from a specific zoom level. And this affects the proper sizing of the jump break and title section of each post. 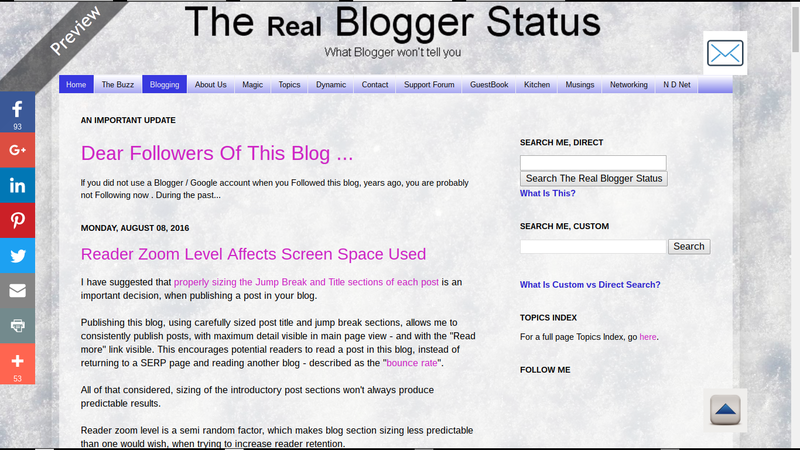 Several details of a #Blogger blog audience affect what post title and jump break section will be more appropriate, for each individual blog. These details, in turn, can affect bounce rate / retention rate.